Hayward EcoStar Variable Speed Pump is the industry's most efficient variable speed pump at any speed that can save pool owners up to 90% on energy costs over a single-speed pump. The EcoStar features a super-efficient permanent magnet, totally enclosed fan cooled (TEFC) motor and industry leading hydraulic design. EcoStar matches pump flow to a pool's needs, versus running at full power 100% of the time. With Hayward's new EcoStar's family of pumps, money flows back into your pocket! 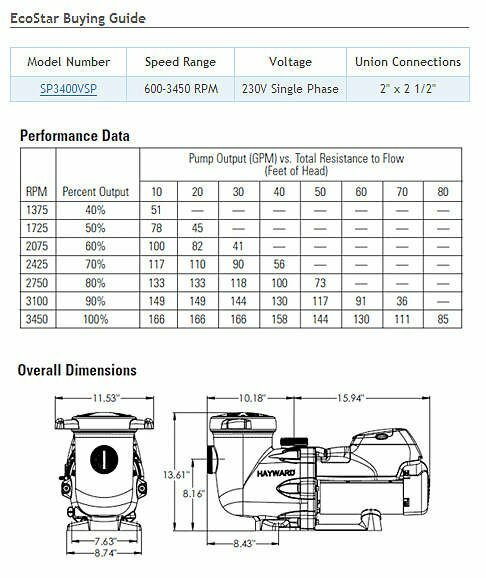 Most efficient pump at any speed. 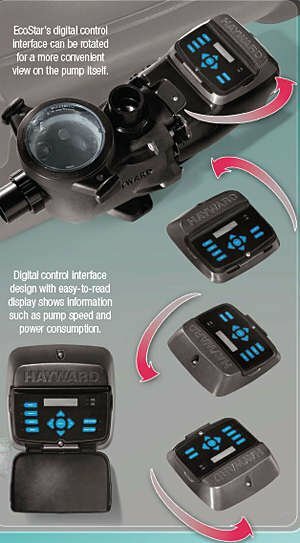 EcoStar can alternatively be controlled by Hayward controls such as Pro Logic® and OnCommand™ or third party controls. WHETHER USED IN NEW CONSTRUCTION OR AFTERMARKET APPLICATIONS, ECOSTAR IS THE PERFECT CHOICE FOR ECO-FRIENDLY, ENERGY EFFICIENT SOLUTIONS!